This custom Kirby has a high attack stat and a Critical Hitter Lollipop to deal 364%. This is otherwise impossible. Equipment is a customization option in Super Smash Bros. 4. Three pieces of equipment can be attached to a character, which will modify their attack, defense, and speed. In Ultimate, equipment is replaced with Spirits. There are three classes of equipment. Orange equipment is based on weaponry and improves attack but lowers defense. Blue equipment is based on clothing and improves defense but lowers speed. Green equipment is based on footwear and improves speed but lowers attack. All three types can also bestow secondary effects, which may either be positive or negative. Up to 3,000 pieces of equipment can be stored, although the limit seems to vary. Older pieces of equipment will be deleted to make room for any new equipment obtained. This table lists the effects of increasing the value of a category. If a category is negative, its effect will be inverted, though not with the same intensity. Stats can exceed maximum values when using multiply effects. Attack Increases damage done by all attacks, including special moves and items (although several item attacks, such as the Daybreak’s blast, Ray Gun shots, Beehive bees, and Hammers are unaffected). Freeze frames are increased proportionally. Knockback is not affected; while opponents will take more slightly more knockback simply due to having higher damage after being hit, the knockback formula only uses the unmodified damage of the move. Having negative Attack will both decrease how much damage the fighter deals and weaken their knockback delivered on top of that, making launching enemies take longer than expected. Equipment that increases Attack also decreases Defense. Defense Decreases knockback taken from all sources, and very slightly reduces damage received. Weight is unaffected. It also reduces the growth rate of Lucario’s Aura. Negative defense values will cause the fighter to take more damage than normal, along with being more vulnerable to knockback. Hazards that normally do not KO, like the catapult in Pirate Ship, may KO fighters with low enough Defense. Equipment that increases Defense also decreases Speed. Speed Increases walking, dashing, air speed, jump height, gravity and both falling and fast-falling speed. Reduces landing lag from normal landings and aerial attack landings (though not other types of landing). Positive speed values will also lower the weight limit for holding Smash Run powers, while negative speed values increase the weight limit. However, having negative Speed will decrease the fighter's walking, dashing, air speed, jump height, and increase landing lag, making recovering difficult. Equipment that increases Speed also decreases Attack. The following table lists what each category affects, and by how much. Values between the listed points are spaced linearly. Note that as the value passes certain extremes, each point of value has less effect. Dr. Mario has the unique trait of having passive equipment statistics baked into his character: his raw properties are modified as if he were wearing equipment of +15 attack and -50 speed. However, unlike with attack equipment, the knockback formula does include Dr. Mario's increased damage multiplier when calculating the amount of knockback dealt. This modification occurs before any actual equipment is applied (e.g. giving him a +50 speed -15 attack equipment will not "reset" him to zero), and in general is largely invisible to the player. Equipment comes in various types, which each have three rarities. Higher rarities result in stronger stat modifications. If a piece of equipment has an extra effect, it does not show its rarity. The frequency rate of each type of equipment appears to be based on how many characters can utilize it - for example, Swords are much more common than Pikmin. Each character has special item types they can equip. The equipment type "badges" can be equipped by any character. Items is simply the default weight limit value that the character has; this is used for Smash Run. The following table collects all bonus effects found on equipment. Negative effects may in fact be desirable if the player thinks they can handle them, as any equipment with a negative effect is balanced by a much smaller stat penalty. Likewise, equipment with positive effects have smaller stat bonuses as a trade-off. Different effects have different degrees of influence on the equipment's stat boosts. There are a total of 93 bonus effects. Wearing multiples of one bonus effect usually (but not always) makes the effect stronger, but not in a linear fashion. Springer Improved jump 1.2x jump height. 1.2x 1.27x 1.34x -34 Also increases footstool jump height. Hopper Weakened jump 0.8x jump height. 0.8x 0.72x 0.65x +36 Also lowers footstool jump height. High Jump Improved ground jumps 1.3x jump height from the ground. 1.3x 1.36x 1.42x -27 Also increases footstool jump height. Lo-Jump Weakened ground jumps 0.7x jump height from the ground. 0.7x 0.64x 0.58x +35 Also lowers footstool jump height. Edge-Gripper Easier edge grabs Increased range for grabbing stage edges. 1.3x edgegrab range 1.5x 1.7x -27 Also increases tether range. Edge-Slipper Harder edge grabs Decreased range for grabbing stage edges. 0.75x edgegrab range 0.6x 0.45x +32 Also decreases tether range. Nimble Dodger Improved dodge ability Gives a little extra time to dodge an enemy attack. 1.1x 1.2x 1.3x -22 Increases the number of intangibility frames in a dodge. Dodgy Dodger Weakened dodge ability Gives a bit less time to dodge an enemy attack. 0.75x 0.63x 0.5x +33 Reduces the number of intangibility frames in a dodge. Desperate Attacker Improved attack in a crisis 1.7x attack power for 20 seconds when damage reaches 100%. 1.7x dmg dealt 1.9x 2.1x -27 Activates once per stock. However, this effect can activate again on the same stock for Bowser, Little Mac, Lucario, or Wario after the use of their Final Smash. Activates in Stamina Smash when the player's health falls below 20% of their max HP. 1.34x -33 Activates once per stock. However, this effect can activate again on the same stock for Bowser, Little Mac, Lucario, or Wario after their use of their Final Smash. Increase is set, and effect wears off completely when time is up. Desperate Immortal Invincibility in a crisis Gain 7 seconds of invincibility when your damage reaches 100%. 7 seconds 8 9 -36 Some Final Smashes, such as Blue Falcon, will ignore this bonus effect if it catches the user before they reach 100%. 1.3x -26 Increase is set, and effect wears off when not at 0%. Trade-off Attacker Improved trade-off attack Start each life with 30% damage, but you have 1.15x attack power. 50% -16 The user glows red (Wii U only). Trade-off Defender Improved trade-off defense Start each life with 30% damage, but take only 0.8x damage from attacks. 70% -25 The user glows blue (Wii U only). Trade-off Speedster Improved trade-off speed Start each life with 30% damage, but you move 1.3x faster. 50% -21 The user glows green (Wii U only). 90% -27 Increase appears to be set, not slowly gained. Also, the user glows (Wii U only). Moon Launcher Improved launch ability 1.3x attack power when launching enemies upward. 1.3x up-launch power 1.4x 1.5x -29 Works between angles of 60º and 120º. Vampire Lifesteal When directly striking an opponent, may recover health relative to damage inflicted. Heals 0.5x damage dealt 0.65x 0.8x -43 Activates 50% of the time. Only heals for 1-2%, depending on the move's strength, against enemy NPCs. Critical Hitter Critical-hit capability Attacks get a 20% chance of dealing extra damage. 20% chance 28% 36% -58 Critical hits do about 3x damage, with knockback compensated. Additional freeze frames are sustained by the target, but not the attacker. Interestingly, this effect also applies to attacks from Pokémon and assist trophies summoned by the user. Countdown Bonus Countdown bonus Greatly improved launch power for the last five seconds of a battle. 2.65x launching distance 3.15x 3.65x -23 The bearer will glow upon activation (3DS version only). Speed Crasher Crash run Do damage to an opponent if you crash into them while dashing. 1-7% range 2-12% 3-17% -27 Damage dealt based on duration of dash. 0.7x -33 Activates even if the incoming attack breaks the shield. 0.8x -15 Only reflects damage from fighters' melee attacks. Activates even if the incoming attack breaks the shield. Fast Bat Smasher Quicker bat swing Faster smash attacks when using the Home-Run Bat. 0.7x bat speed 0.6x 0.5x -26 Only works for the Home-Run Bat item (Ness's side-smash bat is out of effect). Star Rod Star Rod equipped Start battles with a Star Rod. Wave it to fire star-shaped projectiles. Provides item on first stock only. Provides item on first and second stocks. Provides item on first 3 stocks. -12 Items are obtained in order of equipment set from top to bottom. Doesn't work in regular Smash if the item is turned off. Also doesn't work in event matches, as they don't allow outside items. Crouch Healer Heal while crouching Slowly heal damage while crouching. 2.5%/1.5s 3.5%/1.5s 5%/1.5s -30 Crouch must be uninterrupted for the entire 1.5 seconds to receive any healing. 1.25x -27 The increase is set, not gradual. User glows white in Wii U version. Smash Ball Attractor Smash ball gravitation Automatically draw Smash Balls to you. Always moves toward the bearer. Revolves around bearer when caught up. Chases bearer with more speed. Revolves around bearer more closely. Less knockback when struck by bearer. Chases bearer with great speed and little curvature in its path. Attaches to bearer's body when caught up. Much less knockback when struck by bearer. 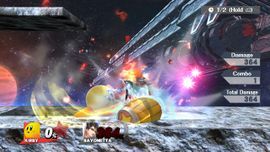 -16 The Smash Ball will move between multiple players that have at least one of this effect active. Pity Final Smasher Respawn Final Smash If you're losing badly, you have a higher chance of respawning with a Final Smash ready. 50% chance 60% 70% -5 Activates upon the same conditions as a Pity Final Smash (being 5 points behind the leader). Does not trigger if the player is a CPU, in 2-player matches or if the user SDs, and only triggers once per player per game. Double Final Smasher Chance of double Final Smash After using a Final Smash, you have a 20% chance of being able to use it again. 20% chance 30% 40% -23 If a character somehow manages to die when attempting a Final Smash, the equipment will still activate. The positive value can be any value from 10 to 90. The negative value is between 50% and 70% of the positive one. For example, a positive value of 35 can have a negative value from 17 to 24. The rarity title is based on the positive value: common is 10 to 30, uncommon is 31 to 60, and rare is 61 to 90. Equipment with a positive bonus effect have a lower positive value, while equipment with a negative bonus effect have a lower negative value. The strength of the modification is listed in the bonus table above, with negative numbers representing positive bonus effects. After the preceding calculations, neither equipment stats can have values between 5 and −5. Badges (Brawn, Protection, and Agility) have their stats multiplied by 0.72, compensating for how any character can equip them. Both the positive and negative stats are rounded down, if necessary. p and n are the positive and negative values, taken after the badge modification. pb and nb are the absolute value of the modifiers for positive and negative bonus effects; they are 0 if not applicable. Risky Respawner and Imperfect Shield are the only effects that do not intensify if stacked, thus making them more convenient for boosting stats. When someone uses their Final Smash, their equipment is temporarily disabled. This is easy to notice with high attack or Auto-Heal. However, if the victim has lower defense, they will take more damage than usual. This can lead to some unique oddities, such as a souped-up Bowser transforming into a significantly weaker Giga Bowser. The names of the Pokémon-exclusive equipment reference battle items in the Pokémon games that would boost a Pokémon's stat. The uncommon and rare variations may be based on the Wonder Launcher items in Pokémon Black and White and Pokémon Black 2 and White 2, which can boost a Pokémon's stats by three or six stages at once rather than one. The icons for these types of equipment are identical to Pokémon's pre-Brawl series symbol. Charizard is the only character to be able to use two types of specialized (i.e. non-badge) equipment within the same category, having both access to X Attack and Fake Nails in the attack category. This also makes it the only Pokémon character that can use something other than badges and the Pokémon equipment. Dr. Mario and Ganondorf are the only clones (counting semi-clones) not to share all 3 types of equipment with their respective parent clones. Conversely, Wario, Ike and the Pokémon characters are the only non-clones to share all equipment types with at least one other character. Mr. Game & Watch is the only character not to share any non-badge equipment with any other character. The Arm Cannon, Beam Whip, Blaster, Zapper, Booster and Space Suit all share the same rarity titles. Turbo Boost's icon is a reference to the Speed Up patch from Kirby Air Ride. There is an interesting glitch when King Dedede is equipped with Double Final Smasher equipment. If he fails his Final Smash, he gains the Final Smash glow as soon as his fail animation ends, but the glow disappears almost immediately after, so he cannot use his Final Smash again. The rarity titles for the Gloves may be a reference to the infamous peripheral. The Legendary Bat equipment shares the same name of one of the Bats that Ness can use in EarthBound. Should a game's save file be hacked to insert a piece of equipment with positive and negative values of 0, the game will delete it. It is possible to have 2 identical pieces of equipment with the same stats, and name, but sell for 2 different prices. This is only noticeable with the Brawn Badge, Protection Badge, and Agility Badge, however, due to the 0.72x multiplier that the badge equipment uses. For an example, a Super Brawn Badge that has +36 attack can either have a 1.22x price scale, or a 1.35x price scale; 50 and 51 are both rounded down to 36 after the 0.72x multiplier is applied. Oddly, when organizing the equipment alphabetically, Super Suit will come before Super Final Smasher equipment. It also happens with Hyper Suit and Hyper Smasher equipment. After selling equipment, if the player quits without saving the changes to the character, they get the equipment back. However, if the player were to feed equipment to an amiibo, and then exit without saving to the amiibo, that equipment will disappear anyway. The only way to get it back is to quit the game without letting the game save. This page was last edited on April 12, 2019, at 08:20.